In most practical cases, heading north is as simple as reading a compass and setting out. In the worlds of sailing and aviation, though, navigation can get a little more complicated. 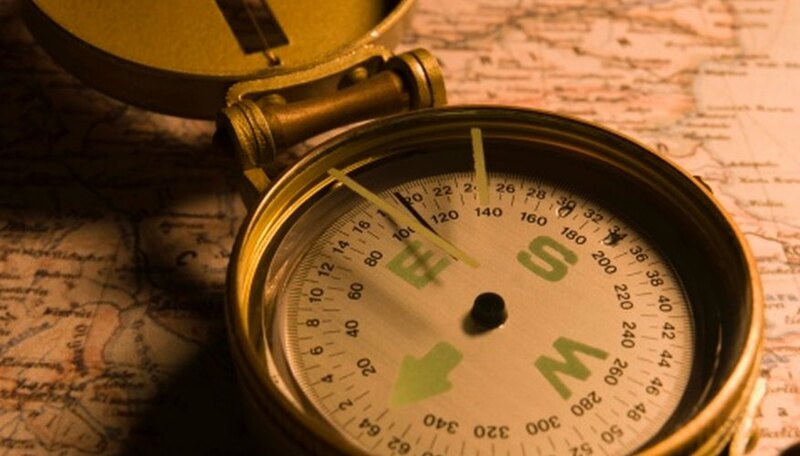 Because of magnetic variation, which is the ever-changing influence of the Earth's magnetic field, and magnetic deviation, which is interference from other objects such as pieces of metal, compass readings can fluctuate and read off enough to seriously interfere with effective navigation. To correct for this, both sailors and pilots must regularly correct their course as indicated by their magnetic compasses by converting it to a "true" course. Read the compass and determine the current compass course or heading. For example, an aircraft or ship traveling due south according to the compass would have a compass course of 180 degrees. Find the magnetic variation for the current area using the chart. On nautical charts, the magnetic variation is located on the compass rose. On aviation charts, the magnetic variation can be read on the nearest isogonic line represented by a dashed magenta line. Add or subtract the magnetic variation from the compass course. For example, if the magnetic variation is 4 degrees east, subtract 4 from the compass heading. If it is 4 degrees west, add 4 degrees. Always add the variation if it is to the west, and subtract it if it is to the east. The result is the magnetic course. Locate the magnetic deviation of the ship or plane. In airplanes, this information is located on a placard below the magnetic compass that will give the deviation for various headings in 15 degree increments. In ships, this information must be determined by starting at a known heading and swinging the boat in a tight circle while recording the compass readout every 15 degrees. The difference between the compass readout and the actual heading is the boat's magnetic deviation. Add or subtract the magnetic deviation from the magnetic course. If the magnetic deviation is 1 degree west, for example, add 1 degree to the magnetic course. If it is 1 degree east, subtract 1 degree. The result is the true course. Navigate according to the true course. Check the charts and recalculate periodically to ensure that the magnetic variation hasn't changed. Remember, always add when dealing with variation or deviation to the west and subtract if it is to the east. As the old saying goes, "East is least ( - ), West is best ( + )."